Some days of the year just seem custom made for activism. Easter, for example, is a great time to ask people not to give their children rabbits, ducks or chicks as gifts. And what better day than Thanksgiving to explain how friends and families can celebrate a holiday without contributing to the suffering of turkeys? Activists have many ways to get the word out, from letters to editors and leafleting, to bringing delicious vegan treats to the office and family gatherings. To help consumers make the connection between Mother’s Day and dairy cows, Liberation BC is asking advocates to wear a special ribbon the group has created. With so many ribbons used to raise awareness these days, this eye-catching, cow-inspired accoutrement is both a simple memorial to millions of exploited cows and a wonderful conversation-starter. Activists can explain that the dairy industry impregnates cows so they’ll “give” milk for human consumption. And to ensure as much milk as possible ends up in dairy cases, newborn calves are taken from their mothers less than a day after mama gives birth. 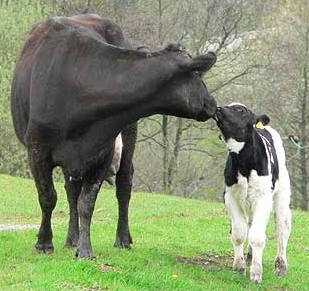 Few sounds are as heart-wrenching as a mother cow bellowing for her calf after they’ve been forcibly separated. She searches for the baby she carried for nine months, plaintively calling for her lost calf. If the calf is a male, he will eventually be killed for meat, often ending up locked in an isolating veal crate until he’s slaughtered about six months later; if the calf is female, she’s taken away to become another in an endless chain of dairy cows. Those other mothers, of course, include hens. The US produces 90 billion eggs and kills nine billion chickens each year, and every single one originates from a hen who has been denied the freedom to raise her young. Instead, the eggs are incubated in industrial hatcheries that breed chickens either for meat or eggs. Because they can’t lay eggs, 200 million male chicks in the American egg industry are killed shortly after hatching; many of these birds are ground up in large machines called macerators while still alive. The females, meanwhile, are born into a bleak life of intensive confinement and suffering; they will most likely spend up to 24 months crammed into a battery cage and laying eggs for human consumption until, their bodies depleted, the hens will be yanked out of their wire prisons and slaughtered for dog food or some other low-grade chicken product. Turkeys, ducks and other “food” birds may not be bred in the same high quantities as chickens, but these babies are also raised in artificial environments and never know their mothers. The cow ribbons are available for a $5 donation, which goes to support Liberation BC’s work in the Vancouver area. To learn more about Liberation BC’s Cow Ribbon campaign, please visit http://cowribbon.com/, where you’ll also find e-cards, downloadable graphics, flyers and more.